Not all Jacksons are going to get you points ! 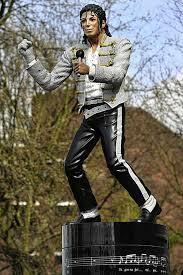 Thankfully since we aren't owned by Al Fugger we're more likely to see a statue erected to Johnnie rather than Michael Jackson. One should never write off our Skip. Yesterday once again he came off the bench to inspire the team to a draw that seemed most unlikely after we'd gone 2-0 down. Looking like we would never score not matter how much time was added on Johnnie Jackson had other ideas. Destiny is sometimes dictated by others but our leader likes to write his own. Good for us as no one else seemed likely to inspire the team. Indeed such was the impact of our captain that we might have snatched a late winner. Truth be told that would have been undeserved but such was his impact that it could have happened ! Our lack of a goal scorer is hitting us hard at the moment and as is the absence of a left sided midfielder. I'm sure I'm not alone in preferring it if McAlney, our Everton loanee, played as a striker despite his early miss yesterday. Neither team played any really decent football and Kit Symons is deluded if he thinks that Fulham deserved to win. I think Kit is trying to paper over the cracks of his team's inability to go on to win from being 2-0 with ten minutes to go. No doubt he's upset at conceding an equaliser in time added on but if his side hadn't been timewasting from so far out then it might not have happened. Hopefully the point gained has a morale boosting effect on the team. Normally an international break would not be welcome but given our injury crisis it could be quite timely. It'd be good if the next time the lads take to the field we have pretty much all our injured back and available. Certainly how much we miss Henderson has been highlighted in the last few games and others have pointed out it's as much for his organisation as anything else. It'd be good to get another player like Jacko although unlikely.........perhaps a sculptor could to make the next best thing.